If we truly want our cats to be happy, let’s treat them with respect for the species that they are. They aren’t accessories, a furry mini-me, a surrogate child or the means to insta-fame. That means learning about what makes them tick. 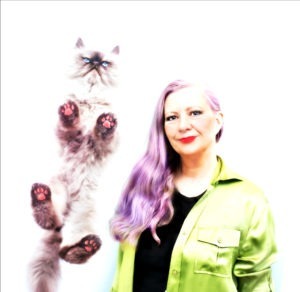 There are excellent books like Cat Sense: Science Reveals Feline Secrets (Read our interview with the author). Many cats thrive with training and most cats could use more inter-active playtime. Cats do get lonely and appreciate time spent with them even if they aren’t lap cats. Treats make cats happy and we feel good treating them, but staying healthy is better. Don’t wait until your cat is ill and suffering to visit the vet. A clean bill of health from a wellness visit will make both of you happy. Needless to say, a spayed/neutered cat is happier and healthier. Happy cat = happy human. Thankfully there is a growing awareness for creating environmental enrichment, dietary data, behavioral advice and products that enhance a cat’s life. Since 2011, it’s been our mandate to provide a wide scope of cat care and stay as curious as a cat. We love cuteness too but it comes with caveats like safety first. One of our top 10 posts (out of 2000+) is Nine Cat Behavior Lessons updated and revised. Enjoy! What Free Gifts Will Really Make Cats Happy. Rufus is a very happy cat. He knows how to ask for (demand) what he wants very clearly and in such an appealing way that we want to do his bidding. He’s my role model! I wish Mickey Mouser could learn from him. Mickey would be happier if nothing ever changed in the house, no one ever visited us, or made any loud noises. At least he’s happy today on this quiet rainy Tuesday. Happy Cat, Happy Cat!!! Sweeter words were never spoken! We try to keep everyone happy but sometimes due to having to take special care of an “outsider” my indoor babies get a might miffed sometimes. 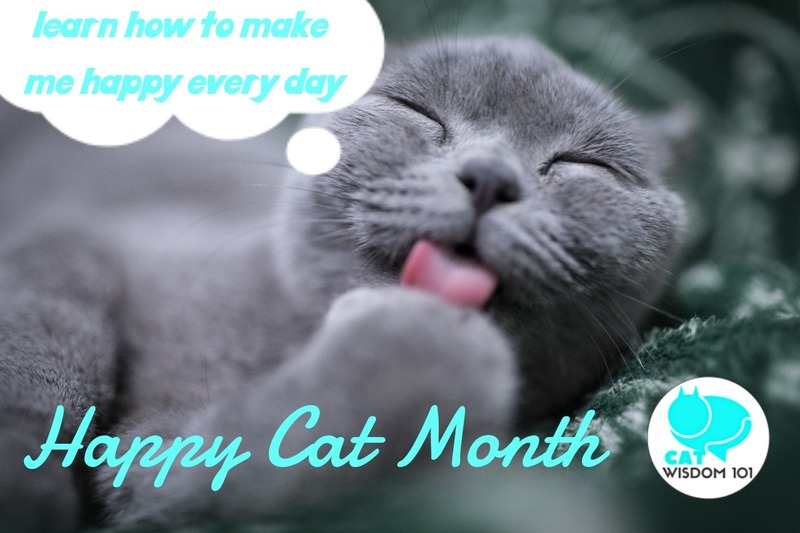 My big wish for Happy Cat Month would be for humans to have better relationships with their kitties, and do more to understand us. Yes, we keep wishing for that too and any positive action. I hope all of our brood is happy. I always like playing with them although some are more playful than others. Currently we have one acting a bit ‘off’. I ‘think’ I know what it is. His buddy the dog is old and blind and diabetic. Odin gets snappy at times as he hasn’t felt well for a bit. It is old age, and sometimes Angus irritates him.Odin never hurts him, but lately Angus’s feelings have been hurt and I think he senses Odin is a short timer now and is a bit sad. A great reminder to know how to keep cats happy. Ched says I do everything just about right – except more baby food and more petting. I tell him I will pet him all he wants (even when he wakes in the middle of the night when I’m asleep, and I will feed him all the best food all the time, even baby food – just plain meat, nothing fancy. We’re very lucky to be very happy cats! We have anything and everything we could ever want. What a lovely reminder to take the time and put our cat’s first and think about what makes them happy. Cat’s aren’t the best at letting us know when something is up, and doing something special is the least we can do for all that unconditional love!